THE SHELLFISH pier at Toft will be closed off later this week after a further attempt to temporarily fix the crumbling structure was ruled out by Shetland Islands Council. The local authority had hoped to employ a specialist firm that could inject a resin to stabilise the structure, but has now been told that the pier has deteriorated too far. Infrastructure director Maggie Sandison said she was nevertheless confident that a solution could be found so that fishermen could continue to land shellfish at the location. 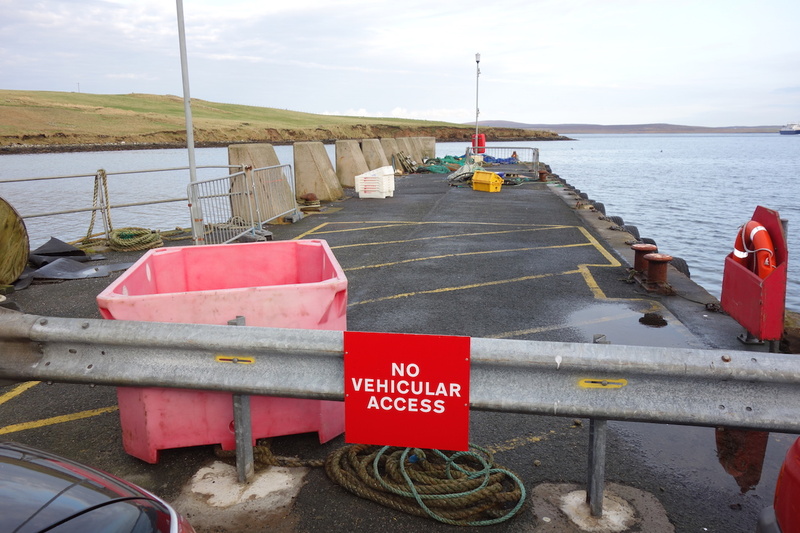 However, they will have to divert to Collafirth or Burravoe for a period of time to allow a pontoon system to be deployed. The SIC is currently investigating how much such a system would cost. Sandison said she was aware that pontoons were “not ideal for landing shellfish” and hence the council was also looking into the possibility of allowing landings to take place at the nearby ferry linkspan for the time being. Emotions flared up last week when it emerged that the pier would have to be closed as it was deemed unsafe. Fishermen accused the council of letting the pier fall into disrepair, adding that they would not pay a 2.5 per cent levy when landing shellfish on a substandard pier. According to figures published by the NAFC Marine Centre, the pier next to the Toft ferry terminal in the north mainland is the second most important landing quay for shellfish in Shetland. Figures show that 14 per cent of all crabs, lobsters and scallops are being landed in Shetland come ashore at Toft, with a value of around half a million pounds. Sandison said that the council could justify investing into the Toft pier if fishermen would pay all the levies that were due. She said she had a meeting with Shetland Fishermen’s Association on Monday to find a solution to the long-standing issue of the industry not paying landing fees on council-owned small piers. Councillor for the area Alastair Cooper described the situation as “delicate” and added he was confident that the “two parties would come together” to find a solution that was beneficial for both sides.